Master the 100 Most Common Words Native Speakers Use For Maximum Communication that make up 50% or more of the language! 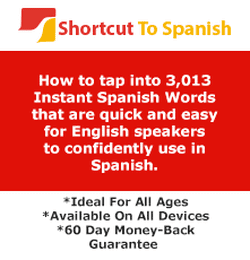 "After spending hundreds of pounds / dollars on other methods of learning Spanish, ie Traditional Language courses, books, even expensive private tutoring, I have found that the methods you use yield far greater, and more importantly, lasting , memorable results." "I am really understanding in a way I never thought was possible. Thanks for this opportunity! Your approach is very rewarding and easy to understand!!!"